I am going to start this off with a general update on how I am doing now. I will then write about how my dentist visit went. Well me and my hubby went to visit some friends on June 26th. We hadn't been over to see them since way back in Feb before I had any work done. The last time I had seen our friends I had told them that I was going to get my teeth fixed. They didnt realize at the time how bad my teeth actually were. I had accomplished hiding my awful teeth. Well we went to their house. When we walked in and sat down. I looked over at them and said "Well what do you think" and smiled real big. He didn't really understand what I meant and looked at me with a puzzled look. She was just in awe!!! I asked him "Well when have you ever seen me truly smile" He then understood and just started babbling lol. "OH your smile is so white, now that you mention it I dont think I have ever seen you smile with your teeth showing." She then chimed in "OH Dena your smile is so beautiful, its just amazing girl, I cant believe it!!!" We talked a bit and they couldn't quit with the compliments. I was just in heaven!!! Then she asked "what did they do for you? How did they fix them so beautifully? Are they crowned? capped? veneered?" I then told her "Well I will be perfectly honest, they are not my real teeth, they are my new dentures." She just couldnt believe they were dentures. She truly thought they were my natural teeth. We went on to discuss all of the details of having my work done etc. That visit really made my day. If friends of ours couldnt tell they were dentures then I think its safe to say that others probably can't tell either. And the wonderful comments they lavished on me really made all the work worth it all that much more. Ok now on to the dentist visit. I went in and had a seat. The assistant asked if I was having any problems? any sore spots? I smiled and told her NO I am not having any problems whatsoever. 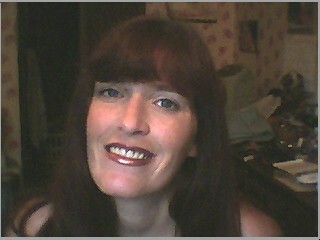 I am doing so great, able to eat, smile, and do anything and everything as if I had never had dentures put in. She then wanted me to take my plate out so she could take a look and see how it was all healing. She took a look all around the inside of my mouth with a bunch of "Oh dena it all looks real good", "Everything is healing very nicely", "You are doing a good job taking care of the rest of your natural teeth", "keep up the good work". I was in heaven. I was getting the recognition of doing my dental care that I was supposed to and that I was healing so good. She then took my plate to the machine that does an ultrasonic cleaning. That took about 10 or 15 minutes. She brought me a magazine to read. While I was reading the dentist came in to chat with me. He said that he had taken a look at the denture before she put it in for cleaning. Said it was very clean already and looked like the soft reline is still intact very well. He then asked the same questions the assistant had, I answered him the same, how well I was adusting etc. I told him that I hadn't found anything that I wasn't able to eat yet. He was smiling and telling me good, thats great. Then he said "Dena, you are just too easy" lol. "This was a quick visit and you are doing great! keep up the good work." Then the assistant came back with my plate and said here ya go. I popped it back in and it tasted so fresh and clean. It had a clean brushed minty taste. I pushed it up into place securing the suction. He watched and said "Yes she has all that down pat, oh and look now at her beautiful smile" I was just beside myself with the praise and compliments. He told me that he wants me to come back in 8 wks just for a check up before we get started in Sept on the partial plate, permanent plate and fixing three teeth on the bottom. So I have eight weeks before I go back. I am going to just relish in this time off before I get started on a lot more work that will be done in Sept. Probably will have to get adjusted all over again with the permanent denture but I dont expect that adjustment to be a big deal at least now I have a little experience knowing what to expect lol. So that is how I am doing now. Absolutely Wonderful!!!!! The denture feels like my natural teeth. Heck I found out the other day I could bite a a nail that had split lol. Thats probably not something I should do but knowing that I could bite something so tiny just made my day lol. I will continue updating from time to time so keep checking. And in September I should have loads of information to add lol.